Gas bubbles are produced in a liquid when there is more available gas than the liquid can actually absorb. The amount of gas that a liquid can absorb depends on several factors, such as the pressure and temperature gradients, the nature and type of liquid and the gas. Air bubbles in particular are the enemy of practical HPLC and ion chromatography. They can cause shifting retention times, pulsating baselines, unexpected changes in peak areas, irregular peak shapes, pump outages and excessively high back pressures. This means that analytical scientists may be unable to distinguish between trace amounts of analytes and the baseline, therefore inaccuracy and poor precision (especially at low signal levels) can occur. It also prevents the determination of analytes that are close to their limits of detection. In general, air includes 78% nitrogen and 21% oxygen. The molecular presence of oxygen can interfere with the detection of some analytes, particularly when electrochemical and fluorescence detection are used. Within HPLC/ion chromatography systems, air bubbles are normally encountered when the air of mobile phase/s has not been removed, when low pressure mixing gradients are formed, when mobile phase filters become clogged with buffer salts, microbes, dust, etc and occasionally if the column interface with detector does not have a sufficiently high back pressure. Consequently in order to address the first two aforementioned circumstances, analytical scientists need to remove the air (degas) from mobile phases. Mobile phases need to be free of air before they reach the pumps. Several degassing techniques are commonly used. They generally fall into two camps: offline or inline/online. Offline degassing is where the mobile phases are degassed before placement within the main body of the HPLC/ion chromatography system. 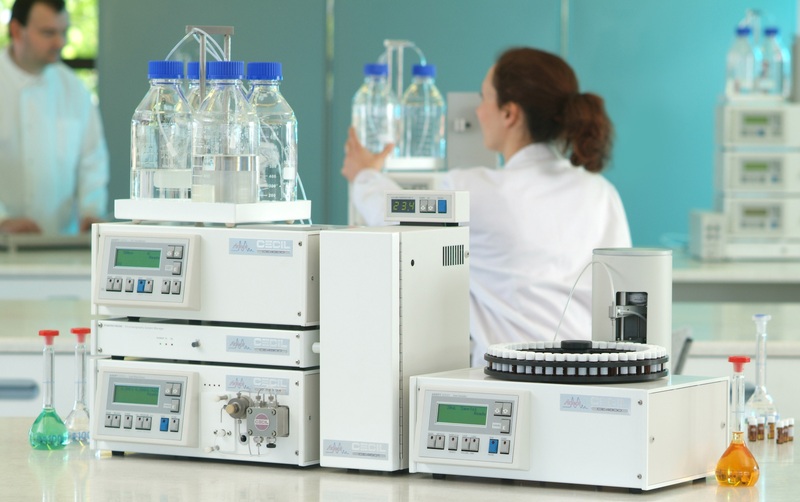 With inline/online degassing, mobile phases are continually degassed within the main body of the HPLC/ion chromatography system. Offline degassing has the major disadvantages that the mobile phases begin to reabsorb air when they are placed within the main body of the HPLC/ion chromatography system and they are time consuming. * Helium sparging. Unlike nitrogen, helium is barely soluble in water. So helium gas is bubbled through the mobile phases. This is actually the most effective degassing technique, but it is off-line and there is a current shortage of helium. * Sonication, by placing containers of mobile phases into ultrasonic water baths and sonicating until the air is deemed to have escaped the containers. * Warming and shaking, which brings the temperature of cold mobile phase to ambient temperatures. Inline/online degassing has the very major advantages of being instant, continuous and time saving. Inline/online degassing involves the placement of a vacuum degassing device, within the body of the HPLC/ion chromatography system, just before the mobile phases enter pumps. The vacuum degassing device contains a gas permeable membrane, through which nitrogen and oxygen molecules are vacuum extracted from the mobile phase. Hence the mobile phases are degassed as and when required. Ironically, inline/online vacuum degassers are theoretically not as effective as helium sparging, but in practice, they are adequate and highly convenient.